So...here's something funny! 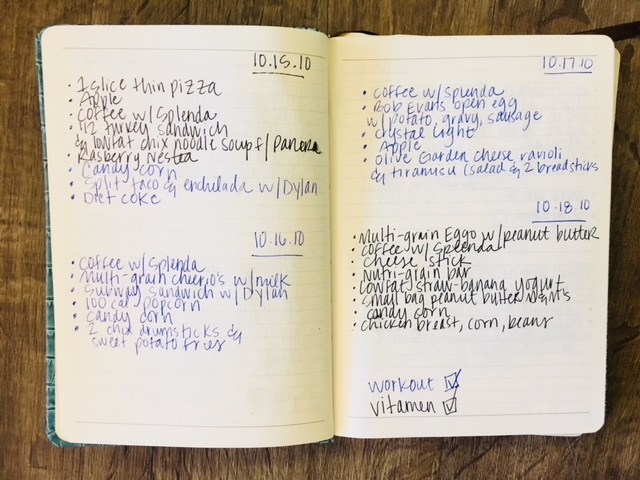 I grabbed an old notebook out of my office to write down some notes for an upcoming CycleBar class and came across a few pages in it that had some interesting things written down in it. So at one point, I was keeping a food journal and keeping track of what I ate every day. This is something I've done off/on for years, but have never done it consistently. Crazy right???? I was shocked. Pre-Whole30, I thought I was eating pretty healthy but this is evidence that I wasn't eating healthy. AT. ALL. Tons of grains and sugar and I'm lacking protein, fats & veggies. (Where are the veggies, for goodness sake--there's none???) This is just an example of the Standard American Diet (SAD) that I've been working hard to refrain from since our Whole30 journey began in 2015. I was a tired mom (to just Dylan at the time) and honestly not very confident in myself. I thought if I monitored what I ate, worked out 1-2x times a week (maybe), and took a vitamin, that all of that would help lead me to be the confident, energetic mom I knew I was meant to be and that Dylan and Dustin deserved as well. 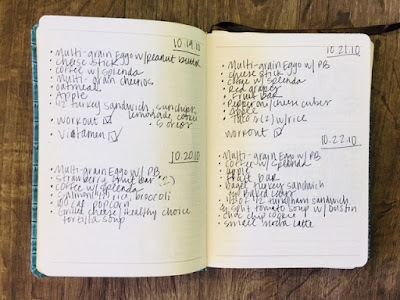 With Whole30, I have been able to find my own food freedom and eat to fuel my body instead of eating all of this crap to give my mind that short-lived rush. I eat more than what was on these pages, and always try to include a protein, fat and veggies in every meal. That snowballed into my love of fitness, personal development, finding a tribe of woman that show mutual love & support to each other, working on my passions every day and paying it forward to others. It all just started with food! Crazy to think how such a simple elimination "diet" has helped changed my life in so many ways. *If you want to feel this way too...I'll be hosting a new Whole30 Group Coaching Session in January. Email me at: coachemilynichols@gmail.com for more info.